We don’t just carry any candy! We’ve carefully chosen brands that are delicious. Whether fine chocolates or fun sweets, you’ll enjoy every brand we carry. Chocolate Moonshine Co. is a family owned business in Western PA. Toot Sweets carries their fudge which is cooked in small batches, hand stirred, and tastes incredible. Their truffle bars were created by encasing the fudge with Belgian chocolate and airbrushing with colorful cocoa butter designs. The hardest decision you will have to make is which flavor to pick! Founded in 1942, Giambri’s Quality Sweets still remains a family run operation located in New Jersey. Toot Sweets features their incredible Belgian chocolate covered pretzels. These pretzels will satisfy your sweet and salty urge. Some customer favorites are oreo, kit kat, or butterfinger covered pretzels. Seattle Chocolate Co. works hard in creating a delectable chocolate truffle candy bar. Many bars are Rainforest Alliance Certified, gluten free, and all are certified kosher. Some of the everyday flavors we carry are San Juan Sea Salt, Tukwila Hazelnut, and 72% Dark Origin. Stop by to see what seasonal flavors Seattle Chocolate has blended to tempt your taste buds. In 1869, the Goelitz family started making candy. In the 1960’s, the jelly bean arrived on their production line. It remains a best seller today. Jelly Belly flavors are incredibly realistic and so delicious. A few choices we offer are Very Cherry, Juicy Pear, and Buttered Popcorn. For the more daring who enjoy game night, we suggest Bean Boozled. We also carry Harry Potter favorites such as Bertie Bott’s Beans and Chocolate Frogs. 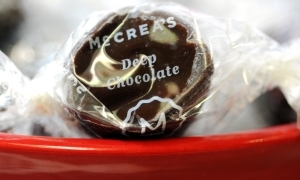 McCrea’s caramels has one mission: to make the world’s best caramel. We believe that they have succeeded. Using the finest ingredients, McCrea’s crafts intoxicating flavors. Choices vary from classic vanilla, deep chocolate, or scotch to more exotic flavors such as ginger fusion or dark roasted mocha. We carry the McCrea’s party box which features four flavors and makes the perfect hostess gift. For the past 30 years Albanese has been producing tasty sweet treats. While Albanese delivers delicious chocolates, such as pecan turtles or triple chocolate malt balls, we love their gummi products as well. One can choose from select flavors like strawberry, blue raspberry or orange creamsicle to name a few. We also carry the 12 flavor gummi bears if you can not decide on just one. Sugar free gummi options are available too.